Thursday May 4th 1893 As soon as wen could got through with the work we went to work in the yard. I put in another hour after dinner. Josie went up town. Mother came over but she had only just got here when it began to rain. by the time Rob was out of school it had stopped enough for them to go home. I read some and wrote to Lizzie Lindley. 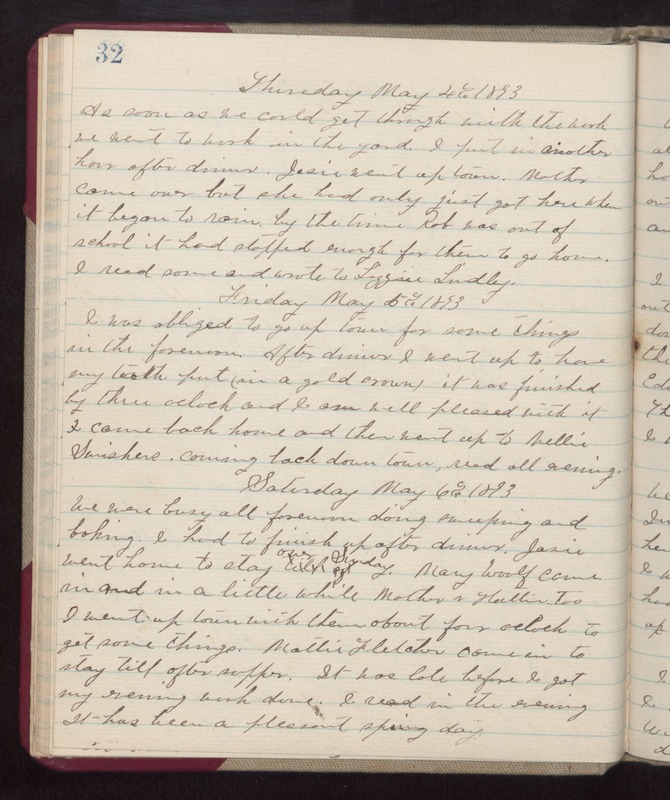 Friday May 5th 1893 I was obliged to go up town for some things in the forenoon. After dinner I went up to have my tooth put in (a gold crown). It was finished by three oclock and I am well pleased with it. i came back home and then went up to Nellie Swishers. Coming back down town read all evening. Saturday May 6th 1893 We were busy all forenoon doing sweeping and baking. I had to finish up after dinner. Josie went home to stay over Sunday. Mary Woolf came in and in a little while Mother & Hattie too. I went up town with them about four oclock to get some things. Mattie Fletcher came in to stay till after supper. It was late before I got my evening work done. I read in the evening. It has been a pleasant spring day.